Asphaera lustrans (Shiny Flea Beetle). Size: approx. 5-7 mm. Photo: 08/05/11, 5 pm. A (truly) Shiny Flea Beetle (Asphaera lustrans). This species migrated into Florida during the 1990s but is now widespread. According to the bug guide, it is sometimes referred to as Gator bug in reference to the UF colors (orange and blue). 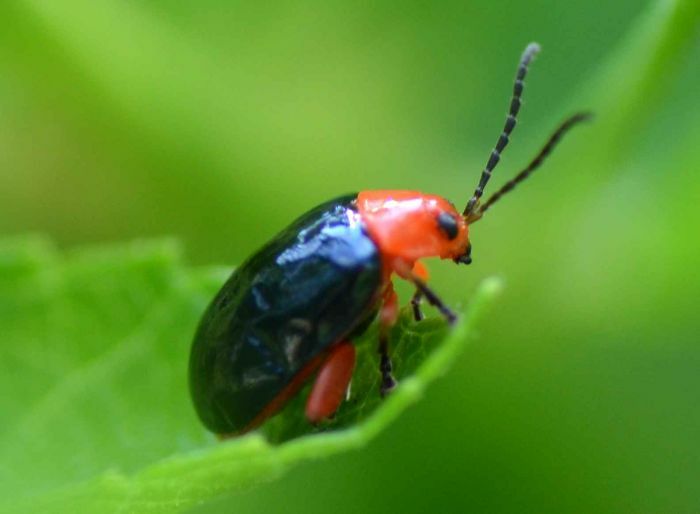 To me this beetle looks more like orange and black, so Seminole bug would be an equally poor description :). A. lustrans is--like many flea bugs--a very good jumper (see strong hind legs/femora).